The two party system is firmly rooted in American politics and has been since the first organized political movements emerged in the late 1700s. The two party system in the United States is now dominated by the Republicans and the Democrats. But through history the Federalists and the Democratic-Republicans, then the Democrats and the Whigs, have represented opposing political ideologies and campaigned against each other for seats at the local, state and federal levels. No third-party candidate has ever been elected to the White House, and very few have won seats in either the House of Representatives or the U.S. Senate. The most notable modern exception to the two party system is U.S. Sen. Bernie Sanders of Vermont, a socialist whose campaign for the 2016 Democratic presidential nomination invigorated liberal members of the party. The closest any independent presidential candidate has come to being elected to the White House was billionaire Texan Ross Perot, who won 19 percent of the popular vote in the 1992 election. So why is the two party system unbreakable in the United States? Why do Republicans and Democrats hold a lock on elected offices at all levels of government? Is there any hope for a third party to emerge or independent candidates to gain traction despite election laws that make it difficult for them to get on the ballot, organize and raise money? 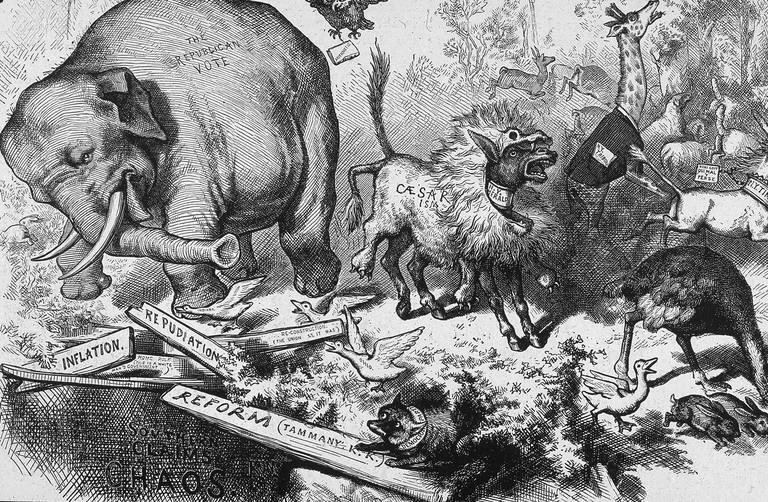 Here are four reasons the two party system is here to stay for a long, long time. Yes, this is the most obvious explanation for why the two party system remains solidly intact: Voters want it that way. A majority of Americans is registered with the Republican and the Democratic parties, and that's been true throughout modern history, according to public-opinion surveys conducted by the Gallup organization. It is true that the portion of voters who now consider themselves independent of either major party is larger than either the Republican and Democratic blocs alone. But those independent voters are disorganized and rarely reach a consensus on the many third-party candidates; instead, most independents tend to lean toward one of the major parties come election time, leaving only a small portion of truly independent, third-party voters. The American system of electing representatives at all levels of government makes it almost impossible for a third party to take root. We have what are known as "single-member districts" in which there is only one victor. The winner of the popular vote in all 435 congressional districts, U.S. Senate races and state legislative contests takes office, and the electoral losers get nothing. This winner-take-all method fosters a two-party system and differs dramatically from "proportional representation" elections in European democracies. Duverger’s Law, named for the French sociologist Maurice Duverger, states that "a majority vote on one ballot is conducive to a two-party system ... Elections determined by a majority vote on one ballot literally pulverize third parties (and would do worse to fourth or fifth parties, if there were any; but none exist for this very reason). Even when a single ballot system operates with only two parties, the one that wins is favored, and the other suffers." In other words, voters tend to choose candidates who actually have a shot at winning instead of throwing their votes away on someone who will only get a small portion of the popular vote. By contrast, "proportional representation" elections held elsewhere in the world allow for more than one candidate to be chosen from each district, or for the selection of at-large candidates. For example, if the Republican candidates win 35 percent of the vote, they would control 35 percent of the seats in the delegation; if Democrats won 40 percent, they would represent 40 percent of the delegation; and if a third party such as the Libertarians or Greens won 10 percent of the vote, they would get to hold one in 10 seats. "The basic principles underlying proportional representation elections are that all voters deserve representation and that all political groups in society deserve to be represented in our legislatures in proportion to their strength in the electorate. In other words, everyone should have the right to fair representation," the advocacy group FairVote states. Third-party candidates have to clear greater hurdles to get on the ballot in many states, and it's difficult to raise money and organize a campaign when you're busy gathering tens of thousands of signatures. Many states have closed primaries instead of open primaries, meaning only registered Republicans and Democrats can nominate candidates for the general election. That leaves third-party candidates at a significant disadvantage. Third party candidates have less time to file paperwork and must collect a greater number of signatures than do major party candidates in some states. There are third parties out there. And fourth parties. And fifth parties. There are, in fact, hundreds of small, obscure political parties and candidates who appear on ballots across the union in their names. But they represent a broad spectrum of political beliefs outside of the mainstream, and placing them all in a big tent would be impossible. In the 2016 presidential election alone, voters had dozens of third-party candidates to choose from if they were dissatisfied with Republican Donald Trump and Democrat Hillary Clinton. They could have voted instead for libertarian Gary Johnson; Jill Stein of the Green Party; Darrell Castle of the Constitution Party; or Better for America's Evan McMullin. There were socialist candidates, pro-marijuana candidates, prohibition candidates, reform candidates. The list goes on. But these obscure candidates suffer from a lack of consensus, no common ideological thread running through all of them. Simply put, they're too splintered and disorganized to be credible alternatives to the major-party candidates.